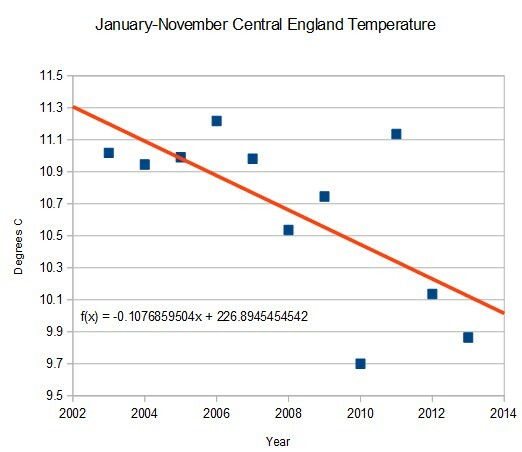 Over the past decade, temperatures in England have been dropping at a rate of 11ºC per century. All while the UK is shuttering coal and gas-fire electric generation, and planning the shift of electric power from industrial to residential use during shortages when the wind isn’t blowing. The tendency toward national/economic suicide is inexplicable. Is this an indicator for the coming grand minimum ? It’s all down to the children who “just aren’t going to know what snow is anymore” sending all those letters to Santa who built a snowmaker to save his toy factory from all the melting. Well done – Crisis-what Crisis ?